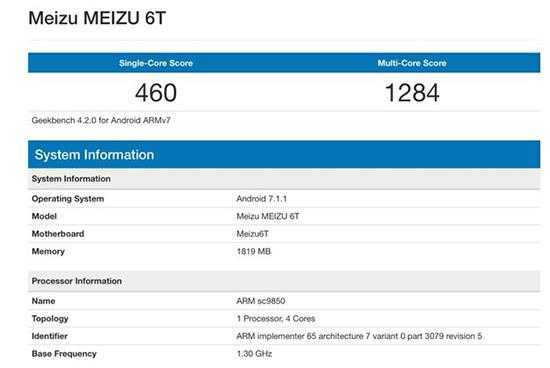 A screenshot of Meizu M6T phone fueled by Spreadtrum SC9850 chipset had surfaced on Geekbench earlier this week. The MediaTek MT6750 chipset includes a 1.5 GHz octa-core processor. The above shown Geekbench listing shows that the M6T will be driven by the MT6750 SoC. However, its clocking speed is mentioned as 1 GHz only. The SoC is coupled with 3 GB of RAM and the device is running on Android 7.0 Nougat. It has scored 612 and 2506 points respectively in single-core and multi-core tests on the benchmarking site. 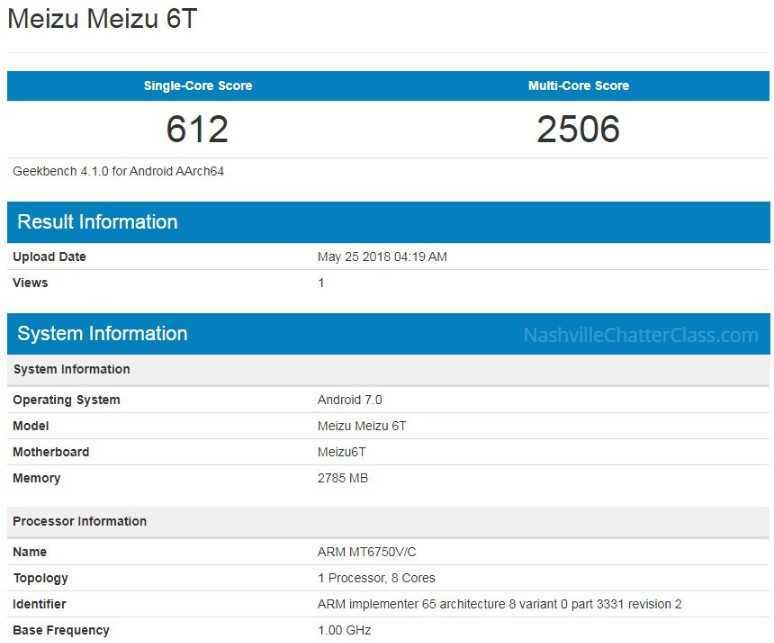 The Geekbench listing of the Spreadtrum SC9850 powered Meizu M6T has 2 GB of RAM. This low configured model scored 460 and 1284 respectively on single and multi-core tests of Geekbench. Through a recent Weibo post, Meizu VP Li Nan has thanked MediaTek for providing high-performance and low power consuming products. He has also claimed that the company is looking forward to use SoCs from other domestic chip manufacturers. Now that the Meizu M6T has been spotted with Spreadtrum SC9850 SoC as well as MediaTek MT6750 chipset, it seems that the company may launch it in two CPU models. Rumors have it that the Meizu M811Q that was certified by TENAA authority at the start of this month could get unveiled as Meizu M6T. The M811Q features a 5.7-inch HD+ display, 3,230mAh battery, 8-megapixel front camera and 13-megapixel + 2-megapixel dual camera. The 16 GB, 32 GB and 64 GB storage models of M811Q respectively features 2 GB, 3 GB and 4 GB of RAM. Meizu has already confirmed that the Meizu M6T will debut on May 29. Recent reports have revealed that it could be a selfie-focused smartphone.